What's the best lawn grass for you? Today we have a wide variety of grass species to select from for adorning our landscape. For Kentucky Bluegrass there are more than 100 different varieties. As late as 1950, we only had 1 variety of Kentucky Bluegrass. With so many choices, how do you know what's right for your backyard? Maintenance required: some grass species require more care than other, high maintenance grasses. Climate conditions: most grasses have a preference for specific climates such as humid, coastal, dry, cool. Temperature tolerance: each grass performs better or worse depending on the average temperature range during the growing season. Drought resistance: some grass species are better suited quickly recover after going dormant during extended drought conditions. Shade adaptation: grass species are classified by how much or how little sunlight they need to maintain their health and vigor. Wear resistance: this is a measurement of how well a grass species can recover from foot traffic. Not every grass is good for every climate. Some species are good for shade, others are good for cold climates and still others perform better in extremely hot areas. The following is a list of the best readily available grasses for specific adaptations. Tall Fescue: (transition zone) low maintenance that offers good drought resistance and better tolerates light traffic. Bahia Grass: (warm season) is low-growing, requiring less maintenance, has a coarse texture, makes a thick turf that fends off weeds. St. Augustine Grass: (warm season) tough, vigorous, thick, weed-blocking. Tolerates some shade, but requires frequent watering, mowing and fertilizing. Standout varieties include Better Blue, Delmar, Raleigh, and Seville. Bermuda Grass: (warm season) fine texture that tolerates traffic. Vigorous and tolerates drought and salt. Does not do well in shade and tends to build up thatch. Standout varieties include: Cheyenne, Patriot, Tifgreen, and Tifway II. Seashore Paspalum: (warm season) tolerates sandy soil, salt, and wet conditions. Holds up to drought and tolerates traffic. 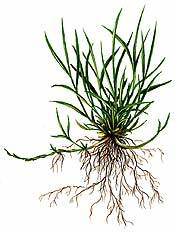 Zoysiagrass: (warm season/transition zone) slow-growing, dense grass, drought tolerant. Does better with frequent watering. Builds up thatch. Standout varieties include: El Toro, Emerald, and Meyer. Kentucky Bluegrass: (cool season) most common cool season grass and the hardiest for cold weather. Fine texture, fills in bare spots quickly, requires more mowing, does not do well in shady areas and does not tolerate salt. Standout varieties include Adelphi, Award, Baron, Midnight, Nu Destiny and Touchdown. Tall Fescue: (transition zone) low maintenance that offers good drought resistance and better tolerates light traffic. Standout varieties include Arid and Jaguar 3. Buffalograss: (warm season) one of the few native North American grasses, is drought tolerant, but doesn't hold up to traffic. Turns brown when it gets hot and when it gets cold. Grows slowly. Perennial Ryegrass: (cool season and overseeding in warm season areas) medium texture, handles traffic, handles drought conditions without a lot of additional watering or fertilizer. Does not do well in shade. Mixes well with other grass types. Centipedegrass: (warm season) coarse, fast-spreading, low growing and requires little fertilizer. Is not drought resistant and may turn brown in high heat. Outstanding varieties include Centennial, Oaklawn, and Tifblair. To find out which of the above best-of-breed grasses will work for you contact a local lawn care professional or contact your local county extension service. They will be able to tell you through trial and error which ones will work for your situation. You also want to be careful about mixing different species together. For example, Fine Fescue and Kentucky Bluegrass are both recommended for cold areas, but the two don't go well together in the same lawn. Fine Fescue is a bunching grass, while Kentucky Bluegrass is a spreading-type grass. You'll end up with clumps of fine fescue growing up out of your Bluegrass lawn and it will look just bad.